Once ranging from the southwestern United States to northern Argentina, jaguars currently inhabit Central and South America, and can be found in wet and dry forests, savannahs and shrub lands. 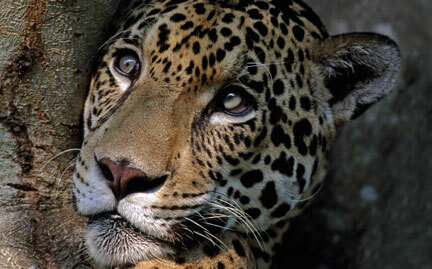 The third largest cat in the world, jaguars may weigh more than 300 pounds and are strong swimmers and climbers. Habitat loss and retaliatory killing continue to threaten the survival of the species. Populations have been greatly reduced in areas where humans have settled.